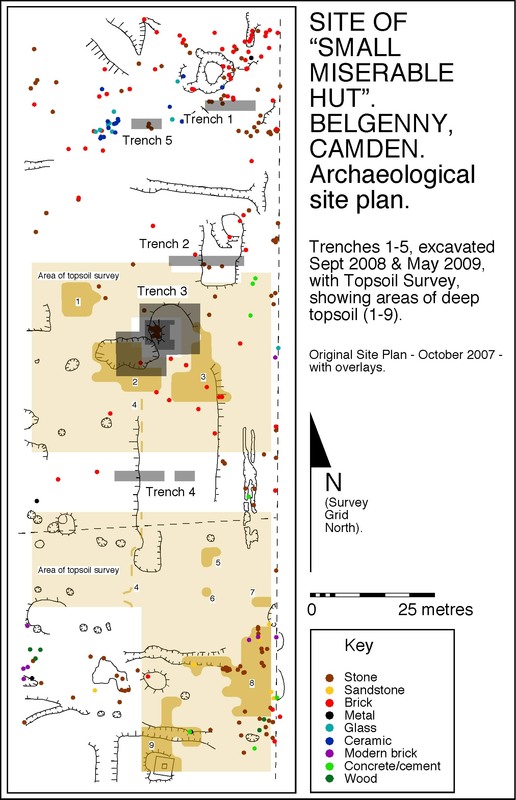 At the end of Season 1 of the excavation in September 2008, the 5 test-trenches had located the building interpreted as the “small miserable hut” (Trench 3) and two out of the three buildings shown on the 1840 estate plan (Trenches 1 & 2). The building in Trench 3 was also thought to be the third building on the 1840 estate plan, but this was revised in the second season of excavation in May 2009. During Season 1 it was noted that topsoil on the ridgeline north of Belgenny Farm only survived within the sites of the early buildings. One way of locating more potential sites would be to simply assess the depth of topsoil by “topsoil survey” – in other words digging a spade hole to test the depth of topsoil every 2 metres on the survey grid already set up. Roy & Lisa Lawrie, soil scientists, were brought in to advise on the reasons for the erosion of topsoil. Their advice pointed to horses as the most likely cause. If horses overgraze a paddock and trample the topsoil, all it takes is rain, wind, drought or flood and the topsoil is easily eroded away. The Belgenny Farm Trust therefore approved the “topsoil survey” as part of the programme for Season 2, together with the full excavation of the building in Trench 3. To the south of this building was a rectangular depression, another potential building site, so both sites were included in an enlarged Trench 3. The excavation team, comprising volunteers and qualified staff, had just one week to complete the excavation – a great improvement on the 3 days usually allowed the Time Team. So, if f you want to take part in future work, please sign up as a volunteer. The excavation revealed the footprint of a 4 by 6 metre building, timber framed, probably with slab walls. The later repair of the building is one interpretation of the wall slots and post-holes along only two sides. The rectangular depression revealed no structural evidence, so it can be ruled out as another building. The results provide further evidence to support the interpretation of the building in Trench 3 as the “small miserable hut”. It is the only building so far investigated that is orientated in the same direction as in the 1836 Conrad Martens painting, with a fireplace at its west end. It is also the only building with Chinese porcelain. But there are still a number of varying theories on the location of the hut that must be taken into account. During Season 2 we located the sites of four other potential buildings (Areas 1, 3, 8 and 9) using "topsoil survey". One of these (Area 3) is the third building on the 1840 estate plan, confirmed by locating brick walls at the base of the spade holes. The other three sites may be agricultural or domestic buildings. If the Belgenny Farm Trust approves further excavation, then the test-trenching of these potential building sites will be a priority, but we will also need to extend the “topsoil survey” to ensure we can locate all the other potential buildings on this ridge of land. While the focus of the first season of excavation was on the "small miserable hut", the focus has now evolved into a study of how the Camden Park Estate grew from 1805 to the 1820s. We can still visit and inspect the second and third buildings occupied by the Macarthurs. Belgenny Farm Cottage was built in 1821 (but only the kitchen wing now survives), while Camden Park House was built in 1834-1835. Belgenny also has the earliest intact group of timber farm buildings in New South Wales, dating from the 1820s. But there are only a few references to tell us about the establishment of the farm. Apart from the “small miserable hut”, there is one other reference to the building of a woolstore in 1813. Perhaps we can locate this building by “topsoil survey”. So this investigation will fill the gap in our knowledge of the development of Camden Park, which is a site of significance to New South Wales and the nation as a whole. It is the intention of the Belgenny Farm Trust to integrate the findings of the project into their educational programmes. It is important that our school students have the opportunity to see these remains and to understand the processes of investigation. It will stimulate their interest in the past and particularly the historical development of our nation. “If we can talk to children at this young age and interest them in archaeology and history, then I think that interest is going to last for life.” Dr. Edward Higginbotham, 10 June 2009. See the newspaper articles in the Camden Advertiser (3 June 2009, second article on 3 June 2009, 10 June 2009). There is a video and extra photographs in the Macarthur Chronicle article (2 June 2009). For a different view, see the letter to the editor in the Camden Advertiser (24 June 2009). For the latest debate, see the Camden Advertiser (8 July 2009, letter to the editor 8 July 2009). Do you want to find out more about John and Elizabeth Macarthur? Check out the Australian Dictionary of Biography. There are some useful references at the end of this entry. See the heritage listings for Camden Park Estate, Belgenny Cottage and Belgenny Farm.